The ability to filter through hundreds of gold stocks, choosing those with the best relative value, among other things, is a skill that our portfolio management team at U.S. Global Investors has over 30 years of experience in. Our primary fiduciary responsibility as active managers is to sift, sort and prioritize these names in order to pinpoint the ones we believe can provide the best opportunities for our funds and to our shareholders. Although we use several technical strategies to accomplish this, I have outlined some of the most important factors we focus on when classifying the best of the best gold stocks. 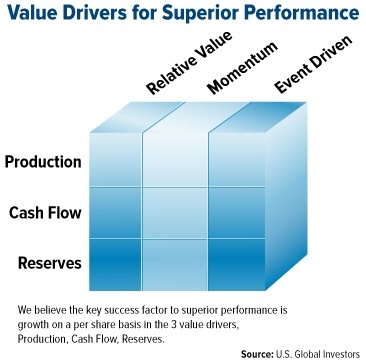 For starters, the portfolio manager’s cube lays out the value drivers behind superior resource stock performance. It draws attention to the intersections among a resource company’s production, cash flow and reserves (rows) and relative value, momentum and event drivers (columns). Using this model, we compare stocks to find attractive opportunities and overpriced risks, particularly in mining companies. We start off by looking at production, cash flow and reserves on a per share basis. 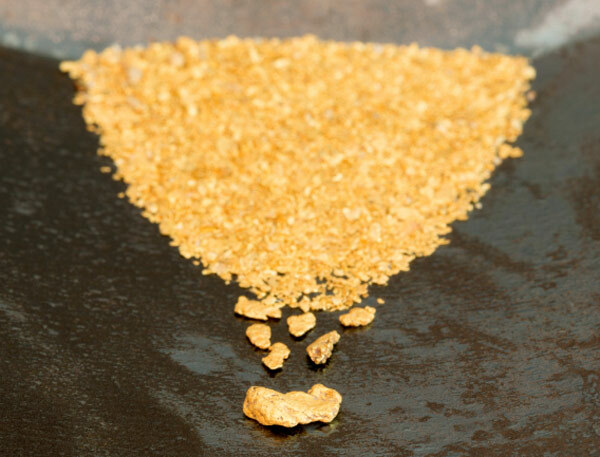 Production lets us know how much gold or minerals a company expects to produce in relation to others, which will directly impact its profitability. Similarly, cash flow deals with the costs necessary to aid in production, and indicates the quality of a company’s income. Does the company have ample cash flow to finance the costly yet necessary infrastructure, equipment, geological analysis and manpower to extract the metal, not to mention pay dividends? For exploration companies that do not have cash flow, we look at burn rate, which describes how long a company’s current cash levels will last before it has to return for additional financing. For example, if a junior exploration company has $15 million in cash reserves and is spending $3 million a month, it has five months to deliver enough reserves per share to convince capital markets it is worth the risk. Reserves are the economically mineable part of a mineral resource, usually demonstrated by an initial feasibility study. The average concentration of gold in the earth’s crust is 0.005 parts per million, making a substantial yield very rare. We want to see growth in reserves. By evaluating these success factors, we have a better understanding of the management and productivity of a company, or its value. But how is it faring in relation to industry peers or its closest competitors? This is called relative value, another important point to consider. Finally comes momentum. We want to know if a company is headed quickly and profitably toward the direction it’s aiming for. Can its upward movement last or are external factors at risk of causing a slowdown or pullback? Many times, results are event driven. This could be mergers and acquisition (M&A) activity, changes in management, new mine discoveries and the like. These are the types of events we keep a close eye on. Using this type of explicit knowledge, along with “boots on the ground” experience, or tacit knowledge, helps us to look for and understand important events that could affect any of these success factors. We are practitioners of quantitative analysis. 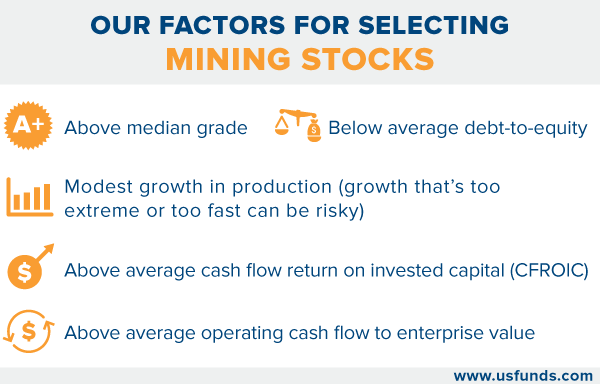 In combination with the portfolio manager’s cube, we screen mining stocks for the following factors. Each factor offers an important glimpse into how a company is handling its overall operations. A mine’s ore grade is the proportion of the metal contained in the ore at the site. Higher-quality mines have higher ore grades and lower-quality mines have lower grades. We focus on stocks that are above median grade. A company’s debt-to-equity ratio shows the amount of debt being used in order to finance its assets, relative to the amount of value represented in the shareholders’ equity. We look for companies with low debt-to-equity. Modest growth in production is important. We want a mine that is producing, but recognize growth that is too extreme can be risky in the long run. Cash flow return on invested capital (CFROIC) is a valuation metric for evaluating the earnings of a company, comparing its cash return to equity. We look for companies with above average CFROIC. Enterprise value to operating cash flow is the ratio of the entire economic value of a company to the cash it produces. Companies with high gross margins and enterprise value also rank well in our quant models. Gross margin is how much money a company has left after incurring costs related to producing the goods and services sold – the higher the percentage, the better. Using technical stock screens and tacit knowledge of management teams can help us uncover hidden gems with attractive growth prospects. This is the value that our investment team at U.S. Global Investors provides for our shareholders and how we seek to generate alpha.